Russian universities are struggling to get to top positions in university world rankings. Players will take positions of the heads of large universities, work-out the strategy of getting in top of one of rankings and try to accomplish these plans to get higher positions. Ranking consists of 5 groups of indices, which includes 13 indices. The team that got the highest place in rankings wins. International univesity rankings Ranking is comprised of 5 groups of indices. 13 values in total are measured: Citation index, Business income/corporate tax, Academic reputation, Students in total/corporate tax, University's Budget/corporate tax, PhD/corporate tax, Defenced bachelors/corporate tax, Research income/corporate tax, Published articles/corporate tax, Scientific reputation, Share of foreign teachers, International co-authorship. Key aspects of the university activities Participants have to make decisions on the matter of such aspects of university's activities as: scientific and innovative activity, education, infrastructure and HR management, working with partner universities, marketing, international activity, management system, finances etc. International university activities The international part of university's activities implies: an increase in citations as a result of publishing research articles in indexed journals, carrying out joint research projects, working with international foundations, invitations of foreign students and teachind staff and much more. Managerial employees of institutes and universities (heads of departments, their vices and common personnel). University's project teams' members, involved in carrying out various changes in universities. Implementation of university development programs Participants should come up with a university development plan, capable of putting them in top positions in world rankings. Within the confines of limited resources, players are supposed to detect breakthrough points and concentrate their attention and resources on these areas. The next step is to convert the plan into a number of decisions and projects, which can help the participants to achieve their goals. University's economics management Investment resources of the university, which can be allocated for fulfilling a program, are limited. Because of this it is important to plan the resource consumption one step ahead, so that university won't end up being in a debt pit. Investment resource should be spent so that in the future university's incomes will be increased, not only expenses. 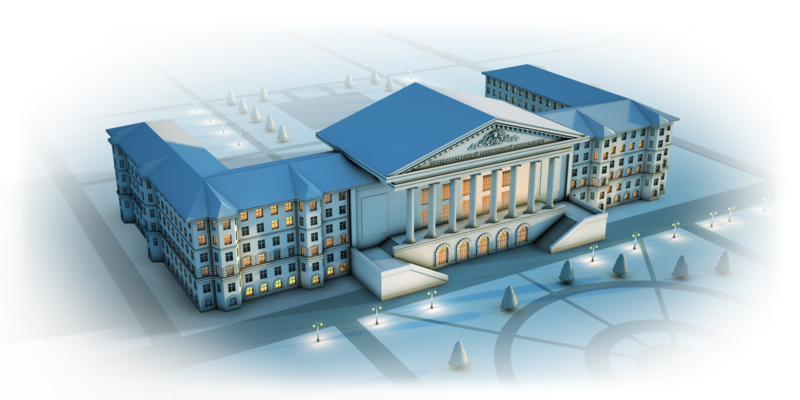 Implementation of a scientific research university model Rating used in the simulation assumes that, in order to get in the top position of world rankings, the team needs to develop a university following the model of a scientific research university. That implies development of a cutting-edge laboratories, research articles' promotion, searching for partners for joint scientific researches, invitation of people with high H-index etc. Methods and techniques to work with international rankings Teams have to come up with method for ranking analysis and parsing of its structure, so that a sequence of steps, allowing for promotion of the university in that ranking could be developed, based on that analysis. Teamwork Participants have to establish interaction and cooperation with each other so they can achieve mutual goals. They'll be presenting their own ideas, organise discussions inside teams, delegate functions etc. Comprehensive view Players have a virtual unversity in their disposition, which is modeled with all the base management aspects and corresponding relations; external environment with international activities and influences is also being simulated. In such conditions the proccess of decision-making is made up of complicated interdisciplinary tasks, demanding the participants to figure out a complete picture of activities. Inclusion of simulator in retreats and discussions of university development strategies. Players will get to manage an average russian university, which isn't enlisted in tops of world rankings at the start of a game. They'll need to learn the starting attributes of the university: number of students and teaching staff, budger, degree of different research areas' development, educational programs' structures, development of international activities. The foothold of the digital simulation is a virtual university with key aspects, local markets and resources as well as the international field. Ranking consists of 5 groups of indices, which includes 13 indices. The goal is to get into top-100 ranks. During the game in-game teams are compared to others by ranking indices groups and places achieved by teams in rankings. Teacher / instructor organises and stages the event by themselves, using manuals and materials for the game. Our team is capable of developing a simulator with certain sector's specifics or introducing changes to existing ones, according to the customer' goals. Our team has a trainer of the university management in new economic conditions. Accents in that simulation are more shifted to inner aspects of managing and competition between virtual universities. Thank you for your request we will answer as soon as possible.